I live in Fort Campbell Ky, and I just found one of these guys in my house. My dogs were playing with it, poor thing, so I brought him outside. I just went back outside to try to find him so I could take a picture, but he was gone. Hopefully he won't come back again! If anyone has any interesting information about centipedes (particularly this one) please let me know. I am very curious about these fascinating creatures. Does anybody know how big these guys can get? I've heard maybe a foot or two. Is that true? And are they the largest species in the U.S? That's another thing I've heard and would like clarified. Thanks! I live in eastern Oklahoma and just killed one of these outside. It seemed to come out of my garage onto the driveway. I had to get a shovel to kill it. It was at least a foot long. They're fast too! One of many color variants of Scolopendra heros Girard, 1853, the largest-bodied centipede in North America, growing up to 7 inches or so. It ranges from Kansas & southern Missouri to Louisiana, and westward through Texas & New Mexico/eastern Colorado to the Colorado River in Arizona. It ranges southward about 1/4 of the way into Mexico, and has not been authentically found west of the Colorado River in California. Is this species endangered? Sightings are not common as far as I know. I would LOVE to capture a live specimen for a period of time (study). If there were a way to acquire a live specimen, I would appreciate notification via email. I've been working on obtaining a specimen myself. If you search google enough you should be able to purchase one. I can't wait to get my habitat built. See forestryimages.org for comparison photo. Where did you find the Scolopendra heros ID? Are there any good sites out there? 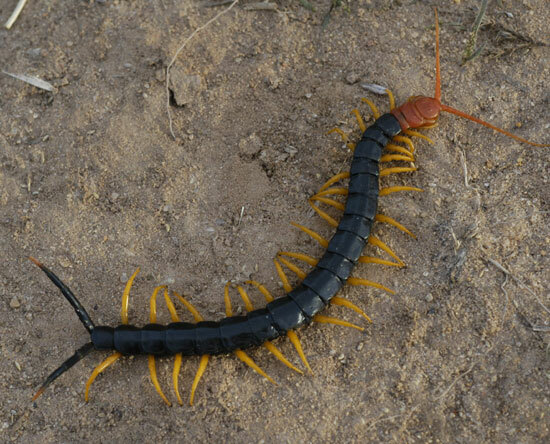 Here in Texas they go by the common name Giant Dessert Centipede. I live just north of Austin, in Cedar Park and have caught 4 of these in the past year, two in my house and two outside in my back yard. I've heard that they are very dangerous, very poisonous and that even each of their legs can prick you with a small amount of poison. It probably won't kill you, but I'm told that it will send you to the ER.